Morris Titanic was unsinkable for the Sudbury Wolves in the 1972-73 season. 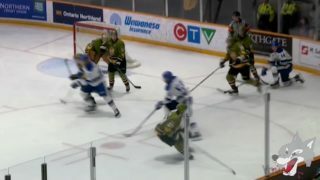 In the team’s inaugural Ontario Hockey Association (now the OHL) campaign, the crafty winger racked up 61 goals and 121 points to lead the team in scoring. 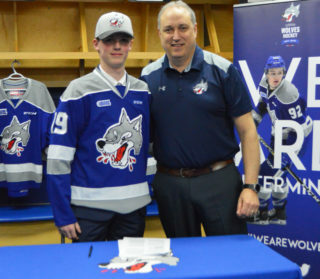 Following the Wolves’ maiden voyage, Titanic was selected 12th overall by the Buffalo Sabres, making him the first Sudbury Wolves player to be drafted to the NHL. After starting his junior career with the Niagara Falls Flyers, Titanic got a new address when the team’s owner, Hap Emms, sold the squad to Sudbury businessman Bud Burke, who moved the team north and rebranded it as the Wolves. While Titanic had loved playing in Niagara Falls, he quickly embraced his new home. “A lot of the guys really got to like it, I liked it a lot. The winters were kind of brutal, but big deal. 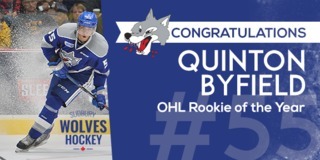 I have nothing but fond memories of that year,” he recently told the Sudbury Wolves in a telephone interview. 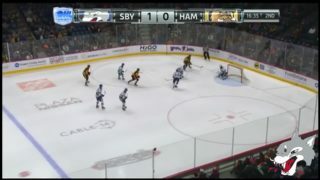 Although Titanic scored 29 goals in his sophomore season with the Flyers, he really elevated his game in Sudbury, recording career highs in goals and points. 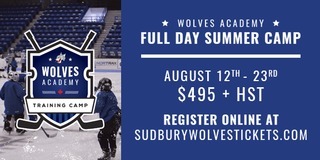 He attributed a lot of the success he found with the Wolves to head coach Barry MacKenzie. “He really helped me and instilled in me a lot of things to take my game to the next level. He was very instrumental in me developing into the kind of player he thought I could be. He gave me lots of confidence and opportunities. It just snowballed from there and I had a great season,” Titanic recalled. When the Wolves’ first season was in the books, Titanic returned to Niagara Falls for the summer. While living with his former billet family, Titanic received a telephone call from the general manager of the Buffalo Sabres, Punch Imlach. “I couldn’t believe he was calling my billet’s house, I don’t know how even got the number,” Titanic remembered. After getting over the initial shock of who was on the other end of the line, Titanic recollected that Imlach told him the Sabres were thinking of drafting him and they wanted to know how much money he would want. Unsure with how to respond, Titanic told Imlach he better talk to his agent, Bob Woolf, in order to sort out the financials. The very next day, Buffalo used its first pick in the 1973 NHL Amateur Draft to select Titanic 12th overall. Although it was a significant milestone, the newly minted Sabre got the news rather unceremoniously while working at his summer job as a gas station attendant. “One of the grease monkeys had the radio on in the shop and he yelled out to me, ‘hey, you got drafted by the Sabres.’ And that was kind of the whole deal. That was as exciting as it got back then,” Titanic recalled. While Titanic was eager to launch the next phase of his career at the NHL level, things didn’t go exactly as planned. “I did not have a really good training camp. You get there with that junior mindset and you’re competing against men. I wasn’t prepared as well as I should have been,” he recalled. After hanging around with the Sabres for the first couple weeks and spending most of his time in the press box, the team sent him to Cincinnati to play for its American Hockey League (AHL) club, the Swords. After scoring 31 goals with the Swords in his first season as a pro, Titanic received a promotion. He started the 1974-75 campaign with the Sabres and made his NHL debut against the Flyers on October 12, 1975. Despite making the jump to the big league, Titanic struggled to stay in the lineup and found himself bouncing between Buffalo and its new AHL affiliate, the Hershey Bears. Following the 1975-76 season, which saw Titanic contend with nagging back issues, he underwent spinal fusion surgery in Toronto. Following a lengthy recovery, which saw him sit out the entire 1976-77 campaign, Titanic returned to the ice, but he was never the same player. Although he scored 70 points with the Milwaukee Admirals of the International Hockey League in 1978-79, a knee injury early into the following season sunk his chances at continuing his pro hockey career. Titanic had some opportunities to play in Europe, but with a young family he made the difficult decision to hang up his skates at age 27. Titanic, however, wasn’t ready to walk away from the game completely. For the next few years, he coached the Buffalo Jr. Sabres and guided the team to a first place finish in the North American Hockey League in 1983-84. But after a few years behind the bench at the junior level, it was time for Titanic to move on from the hockey world. Following his departure from the coaching ranks, he got into the commercial printing business and now works for Keller Brothers and Miller in Buffalo as an account manager. 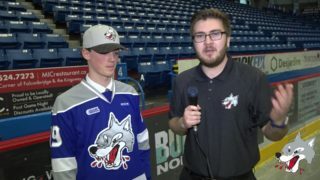 In the years since the Sabres selected Titanic 12th overall in 1973, 123 more Sudbury Wolves players have been drafted to the NHL. With the 2018 Entry Draft set to unfold on June 22-23 in Dallas, Texas, the club hopes to add a couple more names to that list. Pictured above is the 1972-73 Sudbury Wolves and highlighted is Morris Titanic in the top row and just below is Mike Marson and Richie Hanson.